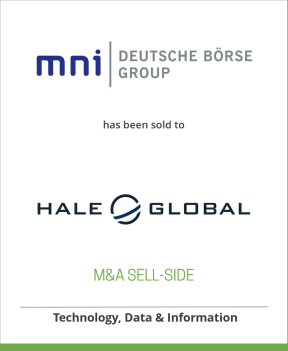 DeSilva+Phillips’ client, Deutsche Börse AG, one of the world’s leading financial technology firms, and the operator of the Frankfurt Stock Exchange, has divested its Market News International, Inc. (MNI) business unit to the Boston-based investment holdings firm, Hale Global. The transaction was led by DeSilva+Phillips Managing Director, Joanna Stone Herman. MNI is a leading provider of macroeconomic and markets intelligence for global fixed income and foreign exchange market professionals. The transaction included MNI’s global news operations, its low-latency data product for algorithmic traders (AlphaFlash), and its portfolio of international economic indicators, including the highly respected Chicago Business Barometer (Chicago PMI). The details of the transaction were not disclosed. DeSilva+Phillips acted as exclusive financial advisor to Deutsche Börse AG in the transaction. Market News International (MNI) is a leading real-time financial news agency dedicated to providing global capital markets with relevant economic, policy and trading information. Founded in 1983, MNI has press credentials recognized by the White House, both US Houses of Congress, the Fed, the Bank of Japan, the ECB, as well as by the governments and central banks of all G-7 nations. MNI has bureaus across Europe, Asia and the United States. Hale Global is an investment holding company with a 15-year track record as a buyer and partner of choice for growth-technology special situations, including divestitures from corporate parents. The firm brings extensive in-house software and mobile development teams, a deep operational bench focused on product innovation, and a track record of fostering excellence in journalism. More information about Hale Global can be found atwww.haleglobal.com.